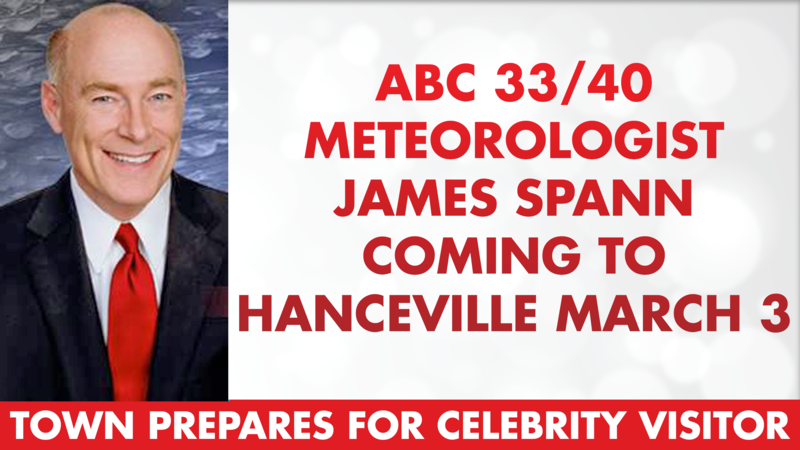 HANCEVILLE – ABC 33/40 Meteorologist James Spann will be making a stop in Hanceville on Tuesday, March 3, 2015. The public is invited to join him, along with meteorologists Charles Daniel, Meaghan Thomas and Brian Peters outside Hanceville City Hall beginning at 4:15 p.m.
James Spann will forecast the weather live during ABC 33/40’s Focus at 4 p.m., the news at 5 p.m., and the news at 6 p.m. In between newscasts, fans will have opportunities to have their pictures taken with the different meteorologists. At 5:30 p.m., James Spann will deliver a short message on severe weather safety. “Our goal is to make sure every family, business and church has a severe weather plan and knows how they will receive the warnings,” said Chief Meteorologist James Spann. This will mark the 19th year ABC 33/40 has conducted a severe weather awareness tour. “We are excited this year to visit some places we’ve never been and to present this information in a new and exciting format,” said Spann. Random drawings will be held for prizes, including James Spann bobble head dolls. Attendees are encouraged to dress appropriately for the outdoors event. In case of bad weather, watch ABC 33/40 for updated plans. Contact Hanceville City Hall at 256-352-9830 with any questions or concerns. ABC 33/40 encourages everyone, especially school groups, civic groups and churches to make signs and gather together for their chance to appear on TV. For more information, please contact Gina Womack, ABC 33/40 promotion manager at gdwomack@sbgtv.com or call her at 205-403-3337.